I have an upper front tooth that broke and needs to be replaced as soon as possible. I understand that an implant and crown can be placed immediately, same day as tooth removal, but there is some risk. Can you explain further? A dental implant is used to replace a tooth immediately after its extraction. A natural-looking temporary crown is attached at the same time via a connecting “abutment” to form a complete tooth-replacement system. Placement of a crown, which will become the part of the new tooth you see in your mouth that sits atop and connects to the implant. There are a number of issues and steps to consider. First of all, it is quite critical that your broken tooth is removed very carefully so that the tooth socket — the bone that supports the tooth — is not damaged. It will become the receptor site for the dental implant. If any bone from the walls of the socket is damaged or lost, it could lead to unsightly gum recession or the possibility of having to end the procedure rather than risk a poor result. Secondly, it is critical to place the implant so that it is stable and non-movable in the bone. The bone around an implant heals by fusing to the implant's specialized titanium surface by a process called osseointegration (“osseo” – bone; “integrate” – fusion with). The tooth socket of an upper front tooth is cone-shaped, and generally the only way to stabilize an implant is to penetrate the apex (pointed end) of the socket and affix it to the bone in this area. It's almost like placing a screw into a previously drilled wooden hole that is too large; the only way to stabilize the screw is by engaging the wood beyond the screw's original length and width. However, when the implant is properly and carefully placed, the bone will grow, traversing the remaining gap, and heal by fusing to the implant. Choosing the right-sized implant for this situation and making sure that it is placed in exactly the right position are both critical to success. In order to keep the immediately placed implant very stable, it is critical that the newly attached temporary crown is made so that it is free from biting forces, which could displace the implant. The position of the implant is also important in order to allow a crown to be attached to it so that it will look lifelike, and will provide a proper shape and template around which gum tissues can heal without shrinking. The implant must be placed so that it is buried exactly the right amount beneath the gum tissues and below the surface of the bone for proper emergence of the crown through the gum tissues so that it will look like a perfectly natural tooth. The crown will be attached to the implant in one of two ways: either directly, or indirectly via an abutment — an intermediary part to which the crown is cemented. The abutment can also be used to create a change of angulation (position) for the crown to emerge through the gum tissue with a more natural appearance. In order to keep the immediately placed implant very stable, it is critical that the newly attached temporary crown is free from biting forces, which could displace the implant. Even micro-movement during the first two months of placement can result in non-fusion and failure of the implant to attach to the surrounding bone. The crown is usually provisional in nature and made of a composite resin, which can easily be altered or modified to ensure that it is both functional and cosmetic. Once the implant is fully fused and integrated with the bone, the temporary crown can be removed and replaced with a permanent one. It's important that you understand the RBAs — risks, benefits and alternatives regarding single tooth implant placement and timing. Immediate single tooth implant placement does have some risks. If your recent implant and crown receive too much pressure or force too soon, the attachment of implant to bone could fail. You must be careful during the first 6 - 8 weeks during healing. Follow your dentist's recommendations regarding aftercare. It is more traditional to allow single tooth dental implants to fully integrate with the bone before “loading” them with biting forces. 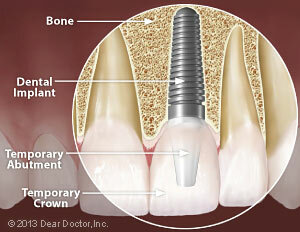 Implant crowns are therefore more usually placed following successful osseointegration. However, research studies show that so-called “immediate” implants have similarly high success rates to implants that were allowed to heal for some months before receiving any type of crown. And with advanced imaging techniques, it is possible to choose the correct implant type and size, to prefabricate the crown (and abutment if necessary) and to fabricate a surgical guide to ensure accurate and exact implant and crown placement. Critical is a word that has been used a lot in this description and advisedly so. As you can see, there are several necessary steps that allow both immediate implant placement after tooth removal, and immediate provisional crown placement to be successful. Preplanning and experience are prerequisites for that success.